I think my favourite colour combination has to be these non-colours (cream, white, grey, beige and black) with lovely snippets of red, olive, mustard, teal and orange. I can't help combining them in my crochet work and I love seeing them being applied so beautifully in these images. Especially in this gorgeous festive door ornament that Miss Tif (aka ~ dottie angel) posted on her blog yesterday as part of her 'week of glee'. Miss Tif was also lovely enough to tell all of how she made this 'cluster of glee' in her post. 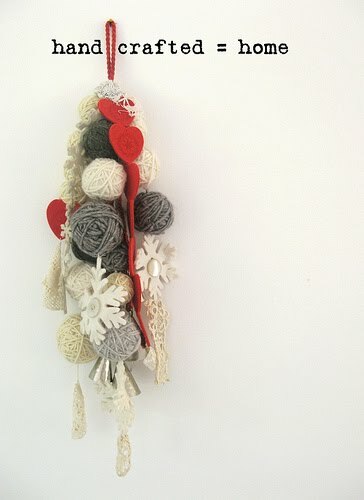 If I can find a few odd balls of yarn that I'm willing to part with I shall definitely be adding a wee bit of festive, granny chic 'glee' to my studio. Such beautiful things, thanks for sharing them with us. Oh how gorgeous and inspiring! I'm off to buy some yarn and get into the crochet Christmas spirit! I'm also delighted to have found and joined your beautiful granny chic group! So lovely. oh miss e, i do like what i find today... your mosaic as always leaves me quite 'gleeful'. you have such a talent with that sort of thing. Hope you're having a wonderful, restful, peacecful weekend Emma, and that your Man is on the mend. I have to tell you i've been having a ball reading through your archives.your blog and creativity is a true delight. Oh, and you are very welcome for the mention over in the Attic, I'm reeeeeeaaaaalllllly happy to have found you and the Granny Chic/All colours in groups, it has been a hugely inspiring and uplifting experience to tiptoe through so much visual lovliness. and for all your enthusiastic comments about the new 'look' for my wee blog! i'm really pleased you all like it because i absolutely love it... i think the reason i'm so pleased with it is because it's the first time i've gone into the html page and started poking around myself ~ i used to pester my man to do it for me! i hope you all had a better weekend than i did! ?